Links and commentary on media, politics and culture by Steve Rhodes. Still posting on my typepad blog. 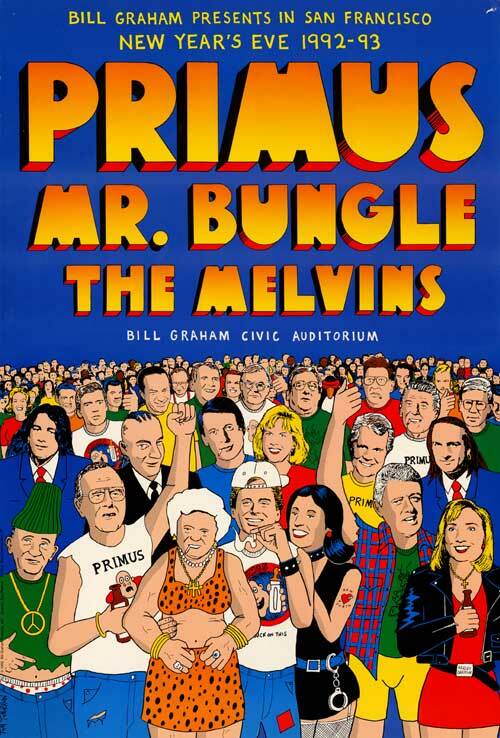 Reagan in a Primus poster (in background on right in a white Primus shirt). I guess given Nixon's Funeral, I shouldn't have expected better coverage of Reagan's death, but the lack of institutional memory was pretty amazing. Perhaps most amazing were the uncritical pieces on Reagan as great communicator. Steve Talbot said in an interview with Mark Hertsgaard, "The argument in [On Bended Knee] was in part that Reagan was so charismatic, so powerful, and had won by such a large vote that the Press Corps in Washington was intimidated by him, and no one dared criticize him." This page on Reagan has links to excerpts from Knee, Joan Didion's Political Fictions and other books. Challenges to the idea that Reagan's arms buildup won the Cold War were sometimes acknowledged, but never articulated. David Stockman, James Watt, Ed Meese among others not mentioned in the coverage I saw. Nicaragua was mostly mentioned in the context of Iran-Contra. Human rights abuses in El Salvador wasn't mentioned at all nor Reagan's opposition to sanctions against South Africa. There is AIDS, Reaganomics, and much, much more. This was my first audioblog post. Basically just saying test, etc. Renee has set up Bloggers for Matt. If you support Matt Gonzalez, add the logo to your site, link to her page and email her, so she'll add you to it. And add yourself to the new online volunteer database. I'm still blogging over at my typepad blog (rather than here). I also have a new photoblog which I tend to update even more frequently. A Reader Asks: In the MasterCard commercial that touts the joys of remodeling a home, the music track being used sounds familiar. Is it the Old 97's? Stuart Elliott: "Someone has good ears," says Joyce King Thomas, executive creative director at the MasterCard agency, the New York office of McCann-Erickson Worldwide Advertising. For the spot, part of the long-running "Priceless" campaign created by McCann-Erickson New York, "we rerecorded the Simon and Garfunkel song 'Homeward Bound,'" says Ms. King Thomas, the top creative executive on the global MasterCard account at the agency. "We wanted a contemporary sound, so we recorded the singer Rhett Miller, formerly of the 'alt-country' band, Old 97's, who is now working on a solo recording career." The song in the spot, which celebrates the comforts of home even with all the imperfections, is arranged by the music production company Elias Associates. McCann-Erickson is part of the McCann-Erickson World Group, a division of the Interpublic Group of Companies. The 8-18/25 double family issue of the New Yorker has a story by David Sedaris, and a short story by Annie Proulx. Anthony Lane reviews American Splendor and Le Divorce, Nancy Franklin reviews The OC, and Hilton Als reviews a performance by Cat Power. Talk of the Town: Gore gives an anti-war speech, the cost of kids, a muckraker, and a teen chef. While I was writing this, the 9-1 issue posted, so I missed some stories from the last issue. I really hate they don't have an archive and never understand how they choose which articles to put online. Anyway, here is the new issue. Talk of the Town: Ben McGrath on the Franken/O'Reilly clash, William Finnegan on the man Charles Taylor into stepping down, Elizabeth Kolbert on the CA recall, and Ben Greenman on the blackout. Adam Gopnik writes from Paris (plus an interview with him), Dave Eggers has a story, Jack Handey on a tatoo, and an old OJ article. David Denby reviews Open Range and Thirteen, an opera review, a review of Norman Manea's memoir, and a profile of poet Stanley Kunitz. I'm experimenting with some new software, so tigerbeat posts will probably be here (with more frequent updates). Tonight many PBS stations will be showing Robert Capa: In Love & War. The excellent American Masters program on the photographer has more movie connections than you'd imagine. It features an interview with Steven Spielberg who used Capa's photos as a guide for the Omaha Beach sequence in Saving Private Ryan. Capa had an affair with Ingrid Bergman. Director Anne Makepeace interviewed Isabella Rossellini who would only talk about what her mother wrote about in her autobiography (she reads from a tattered copy). Capa urged Bergman to see Open City as an example of the kind of work she should be doing. He introduced her to Roberto Rossellini. Also interviewed is Peter Viertel who wrote a number of films including Saboteur, The African Queen, The Old Man and the Sea, and The Night Heaven Fell (he is also married to Deborah Kerr). Capa was friends with John Huston and the set photographer on Beat the Devil. At a Q&A when the documentary was shown at the San Francisco International Film Festival, Makepeace said Viertel and Huston had talked about doing a movie on Capa, but decided not to because people would picture the actor who played him rather than Capa. She said a movie is in development on Capa's experiences during World War II which will star Pierce Brosnan and be based on Alex Kershaw's biography Blood and Champaign. Makepeace looked at 70,000 of Capa's negatives to choose the images for the film. Capa had a short-lived film production company with John Steinbeck and co-founded the Magnum photo agency. On most PBS stations, it will be preceded by Charles Guggenheim's last documentary, Berga: Stories of Another War. Guggenheim was nominated for four Academy Awards and is perhaps best known for his tribute to Robert Kennedy which was shown at the 1968 Democratic Convention. If you miss them tonight, both documentaries will be out on DVD. Online viewing tip. The website for the Capa doc has an interview with Makepeace and interviews not in the documentary including several clips of Isabella Rossellini. The website for Berga has an extensive multimedia section. Katha Pollitt won the National Magazine Award for commentary for her columns in the Nation (the complete list of winners and more detailed citations). The three columns submitted are online: God Changes Everything, Backlash Babies, and As Miss World Turns. There is also an exchange with Christopher Hitchens who she beat out for the award. The jury wrote, "Katha Pollitt is a proudly reconstructed feminist, yet one who never shies from noting weaknesses and contradictions in conventional thinking about women?s issues and other issues of social importance. Her ability to combine wit and passion in a forceful argument is a model of concise commentary. These are gems of polished writing." Pollitt has written 18 amazon reviews and earlier suggested ten books for Mother Jones. The Money double issue of the New Yorker has a story by Sherman Alexie and a Q&A. Anthony Lane reviews Lilya 4-Ever. John Lee Anderson reports from Bagdhad. And several stories about being fired. Evelyn McDonnell wrote back in January about going to concerts pregnant. The lack of women directors in Hollywood. The controversial Seymour Hersh article in the new New Yorker. Last week's New Yorker. Lehman on Bush's decision to go to war. Hersh on the forged nuclear papers. A T. Coraghessan Boyle story. They didn't post Larissa MacFarquhar's profile of Chomsky (though they did have a roundup of Chomsky on the web (something I did for Netsurf in Wired back in 1994). Safe Conduct opening in San Francisco Friday and other cities (check play dates). Amira Hass who was the subject of the documentary Between the Lines which I saw at the SF Jewish Film Festival last summer has won the UNESCO Guillermo Cona World Press Freedom Prize for her reporting from the West Bank for Haaretz (which has a story). Vivienne Walt who was on a panel about the documentary and reporting on conflict has a Bagdad Journal piece on the Columbia Journalism Review site. Haaretz is worth checking frequently and not just for reporting by Hass. Flaws in the Afghan model takes a critical look at what has happened as the result of the last US military campaign (how quickly we forget). There is a piece on Dr. Adnan Pachachi who might become the first civilian leader of Iraq following a war. A profile of Bono in Christianity Today. A 1999 NYT Mag profile of Ira Glass. The New Yorker finally puts up an archive of film reviews, but they are only the capsule reviews since 1990 which open as pop-up, so they aren't easy to link to and you can't search. At the very least, there should be links to the full reviews which have appeared since the magazine went online along with all film related articles. So I'll have to continue to link to Anthony Lane's reviews (including this week on "Dark Blue" and "All the Real Girls"). Lane also has a Talk of the Town. More in this issue: After Iraq by Nicholas Lehman, a humor piece by Susan Orlean, David Remnick on Vaclav Havel, Adam Gopnick on Joseph Cornell, and TV sweeps month. I can never understand how they pick which articles go on line and which don't. Peter Boyer's piece on Augusta National isn't online. Neither is Louis Menand's piece on Bonnie & Clyde though the original review and a 7,000 word essay by Pauline Kael have been put online. And you still can't search the site. It is pretty amazing that what should be one of the best sites on the web is so bad. Individual writers including Susan Orlean, Malcolm Gladwell, Rebecca Meade, Jerome Groopman, John Seabrook have their own sites which are much more useful than the magazine's (though not always updated enough). Anthony Lane reviews Lost in La Mancha and the Guru. Through Feb. 9th, there is a retrospective of films directed by Dorothy Arzner at the James Bridges Theater at UCLA. It will be traveling to other cities (and hopefully the films will be released on DVD). Susan King had a story in the LA Times. Looking at the related stories at the end of New York Times articles is always interesting. Often they have nothing to do with the article and articles that should be included aren't there. And even if they were, you wouldn't pay to look at the story. piece by Peter Jackson on filming the Lord of the Rings which was linked at the bottom of Karen Durbin's interesting column on the Two Towers. Helicopter shots of the anti-war demo in San Francisco. the nyer fiction issue (blogged as a cat licks my hand): stories by < HREF=http://newyorker.com/fiction/content/?021223fi_fiction>Zadie Smith and Annie Proulx and pieces on Dr. Suess and David Hammons.